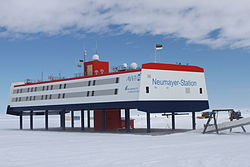 Stefan, DF7FC, informs that since a few weeks the German Antarctic research station Neumayer III is running a Red Pitaya on a wideband RX antenna to receive/decode/upload WSPR reports on up to 8 bands simultaneously. You may have noticed them already on the WSPR map on other bands. There are regular spots on 160 m from Europe. They seem to have quite a good satellite internet connection, uploading WSPR spots is no problem. They also run an up to date webcam showing an image (www.qrz.com/db/dp0gvn). DP0GVN in IB59UH will receive WSPR(2) on 630 m daily between 4 .. 7 UTC now, but Stefan asked to extend the time to 20 .. 07 UTC. Jim, W5EST, wrote an interesting overview of possible 630 m paths to DP0GVN. See njdtechnologies.net/030818/ (scroll down to “WHERE AND WHEN? 630M SIGNAL PATHS TO DP0GVN IN ANTARCTICA“) and njdtechnologies.net/031018/ (scroll down to “PART 2: WHERE AND WHEN? 630M SIGNAL PATHS TO DP0GVN IN ANTARCTICA“). Tnx Roger, VK4YB, for the info.